The Toon Boom Studio Blockbuster effects allow you to add some glamour and bang to your animation! ‣ In the Special Effect toolbar, click the Blockbuster Effect button. ‣ Select Element > Add > Blockbuster Effects. ‣ In Timeline View toolbar, click the Add New Elements button and select Blockbuster Effect from the Type list. A Blockbuster effect layer, as well as its child, a Sprite-Drawings layer, is added to the Timeline view. 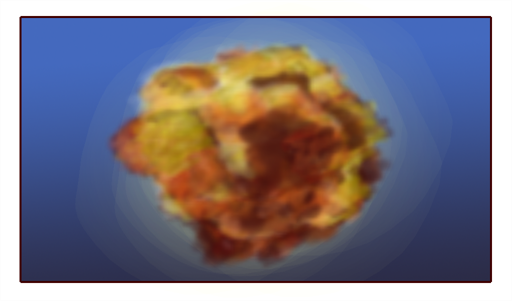 A sprite is the particle multiplied and generated by the Blockbuster effect. 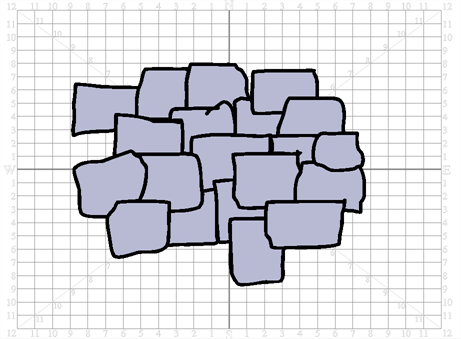 In the example below, a drawing of a brick is used as the sprite. By default, the brick wall shatter effect is selected and visible in the Camera view. 2. You have the possibility to create your own effect and customize it as you want. 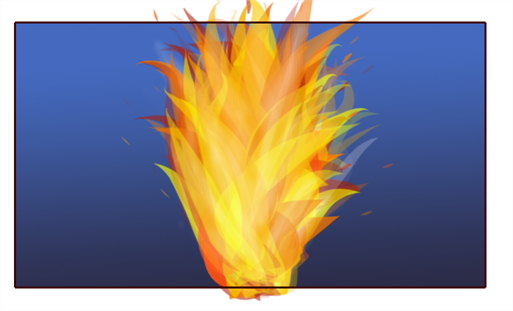 Create your own particle on a drawing layer, or import an image to use as a sprite (particle to multiply in the effect). 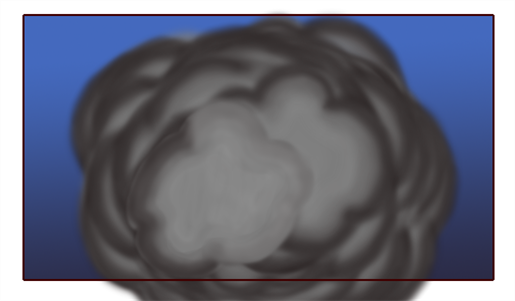 Then you can attach that drawing to the existing Blockbuster effect and it will override the default content. 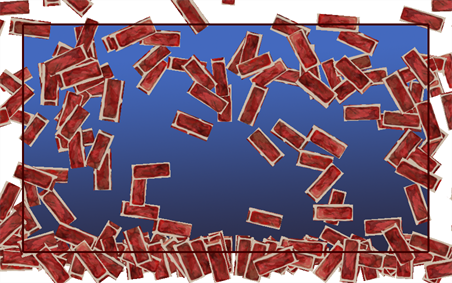 In the case of the Blockbuster Shatter effects, the first image will be used as the image to break to pieces and the second drawing will be used as the pieces and area to break in the first drawing—see Shatter Effects. For the Magic and other Blockbuster effects, traditionally animated drawings will be treated as multiple versions of the same particle type. 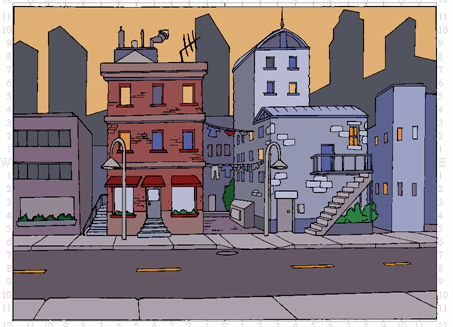 For example, a traditionally drawn walk cycle appears as a series of frames on the same layer. Each frame contains a slightly modified version of a character's legs and arms moving. 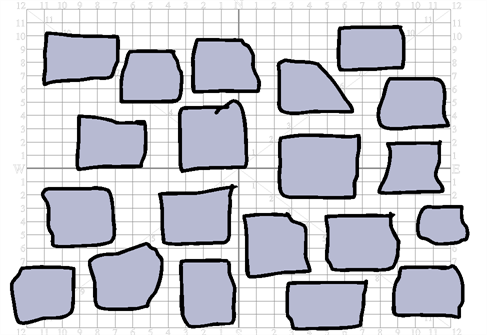 If this layer were to be used as a sprite, all those different drawings would be randomized and appear as non-sequential, static, singular particles in the effect. Therefore, if you draw a glitter particle in the first cell, a different colour glitter particle in the second cell and a different one of another colour in the third frame, you will obtain a multicolour glitter effect. You can use this behaviour to your advantage; for example, in the event that you want to create five types of stars to be multiplied and generated. Simply create five different drawings on the same layer, but drawing each on their own frame. 3. Drag your newly created Sprite layer onto the Sprite-Drawings layer to parent it. The Blockbuster effect Sprite (unseen in the Timeline view) is automatically overridden by your custom Sprite. If no sprite is created for a Blockbuster effect, the default sprite will be visible. • Wall Destruction: This is the default setting. • Wall Breach: Only a portion of the wall breaks apart. • Wall Breakthrough: A character shape breaks away from the wall giving the illusion a character ran through. • Bottle Explosion: A bottle explodes completely breaks apart . • Bottle Break: A bottle breaks apart. • Bottle Fragment: A bottle cracks and breaks. • Shattered Glass: A glass pane is shattered to pieces. • Broken Glass: A portion of a glass pane is broken to pieces. To create your own shatter sprite, draw your pane in the first cell of a drawing layer. In the second cell, draw the pieces in which you want the pane to break apart. 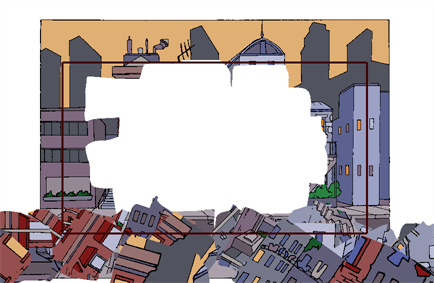 The areas where there will not be any drawing will remain untouched. If you want your pane to break in pieces without leaving a gap between the pieces, draw your pieces separately. 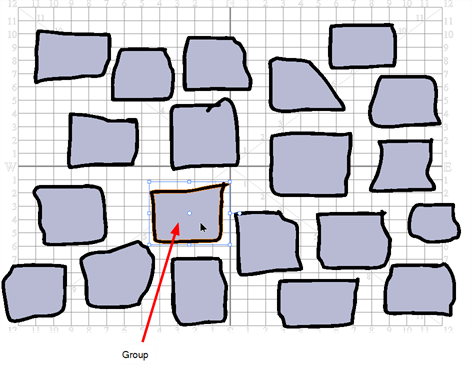 With the Select tool, move them together so that they overlap. If you want to make sure that the outline remains with the painted zone and that your pieces do not get mixed up, you should group them (outline and colour fill) together before overlapping your pieces. 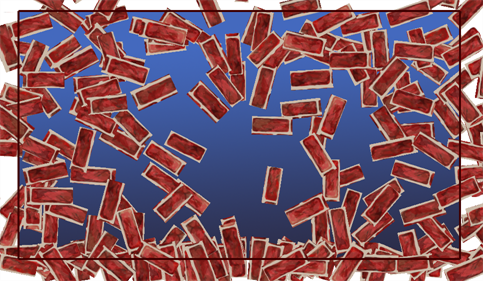 Once your sprite is ready, you can drag your sprite drawing layer onto the Sprite-Drawings layer of your Shatter Blockbuster effect. • Glitter Shower: This is the default setting. • Glitter Mist: A light glitter rain falls down. • Glitter Fall: A string of glitter falls down as from a fairy or magic wand. • Ocean Bubbles: A large amount of bubbles float up. • Sea Bubbles: A series of bubbles float up. • Aquarium Bubbles: A few little bubbles float up. • Omni Star Storm: A series of multicolour stars rush toward the screen. 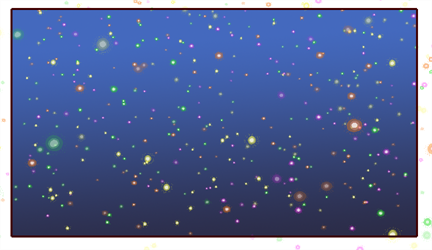 • Omni Star Mist: A few multicolour stars float toward the screen. • Omni Star Spin: Stars spin in the scene to similate dizziness. • Blast: This is the default setting. • Blowup: A big smoke cloud explosion. • Bang: A small cloud explosion. • Long Electrical Circuit: A long lightning bolt between two electrodes. • Medium Electrical Circuit: A medium lightning bolt between two electrodes. • Short Electrical Circuit: A short lightning bolt between two electrodes. • Dazzling Fireworks: A series of multicolour fireworks. • Brilliant Fireworks: A few multicolour fireworks. • Glittery Fireworks: One multicolour firework. • Water Splash: This is the default setting. • Water Spray: A medium water splash. • Water Squirt: A small water splash. • Goop Splatter: A big goopy splash. • Goop Blob: A medium goopy splash. 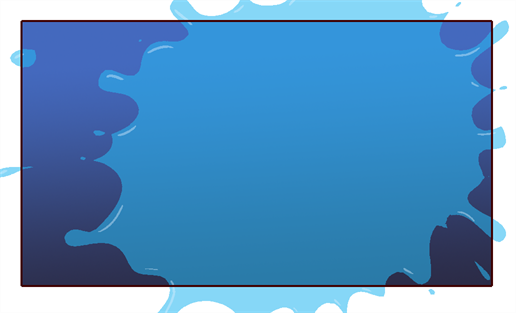 • Goop Dab: A small goopy splash. • Mud Splatter: A big muddy splash. • Mud Blob: A medium muddy splash. • Mud Dab: A small muddy splash. The Splash effect custom sprite does not work like other Blockbuster effects. The sprite must be a traditional splash animation. • Inferno: This is the default setting. • Fire: A medium size fire. • Flame: A small size fire. • Smoke Screen: A big smoke chimney. • Smoke Fog: A medium smoke chimney. • Smoke Cloud: A small smoke chimney. • Blaze: A huge spark. • Ignite: A medium spark. • Spark: A small spark. The Fire effect custom sprite does not work like other Blockbuster effects. The sprite must be a traditional fire animation. • Brilliant Supernova: This is the default setting. • Bright Supernova: A big and bright supernova explosion. • Glimmer Supernova: A small and faraway supernova explosion. • Intense White Nova: A gigantic white nova explosion and its large smoke ring. • Luminous White Nova: A big white nova explosion and its smoke ring. • Light White Nova: A small white nova explosion and its smoke ring. • Meteor Storm: An intense and large meteor shower. • Meteor Shower: An medium meteor shower. • Meteor Mist: An small meteor shower.